Glittering jewels have been sought after since man realized they were precious. They are fought over, and fawned over- jewels make a woman smile, a collector sigh, and a child's eyes dance. Jewelry design is a hobby enjoyed by many. From beads and glass to semi precious stones to pearls, all of those are being made into jewelry at home, as a hobby. But if you want to take it one step further and make it your profession, you will find that there is a lot more to be learned- and you'll actually enjoy learning it. There are some online and off line courses in jewelry design offered by accredited institutions. They target those who really want to know the materials they are dealing with and how to turn it into their calling card or their own business. The jewelry designing courses teach the differences in the specific metals and their durability. Also, the courses teach you about the different techniques in making jewelry; casting, die striking and electroforming to name a few. You will get to know, on sight, the difference between various types of gold and how it affects the appeal and value of the jewel. You will learn about precious stones, the different purities and the different cuts. The courses will teach you about past jewelry designs and how to repair them, and new trends with new materials. Anniversary and wedding ring design is also taught, as well as jewelry for other occasions that have specific jewelry associated with them. And the new technology in the form of computerized imaging called 3-D CAD (Computer Aided Design) that enables the designer to see in 3-D how the design will look at the end. This is the most popular program in all aspects on design and knowledge of its operation is very important. On the other side, there are courses about the commerce of jewelry design from choosing the right materials which impacts the price of the piece of jewelry through economics of manufacturing. The courses are designed to make you ready to present your work either in the form of a portfolio that can serve as your calling card or, if that is what you wish, in opening your own jewelry design business. How to present yourself and how to sell your creations is an art form by itself and the most important factor in the success or failure of a business. Trying to go at it alone is a long, and expensive, road of trial and error. Education, on the other hand, and a jewelry design degree, will open the door much quicker, because you will be more knowledgeable about the whole process from beginning to end. 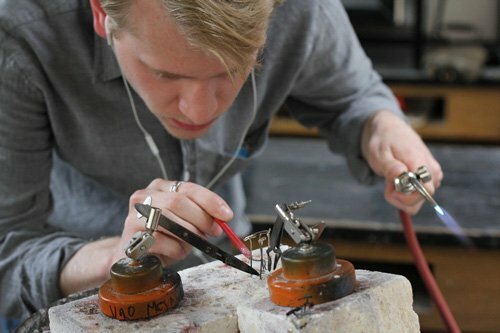 Getting a degree in jewelry design and repair can save years of learning on your own. It will also save money in the long run when, with the education you obtain through the courses, you will be able to capitalize on your talent and turn your hobby into a profession.